In all my years of being raised in Brookline and gallivanting in Boston, regarding outside eats, I’ve never had a favorite diner. I’ve had the pleasure of eating at a handful of them such as Victoria’s, South Street, and Mike’s City. There are plenty to choose from as Boston has maintained a diner culture considerably healthier than New York City’s (right now). But I cannot claim a go to-greasy spoon. 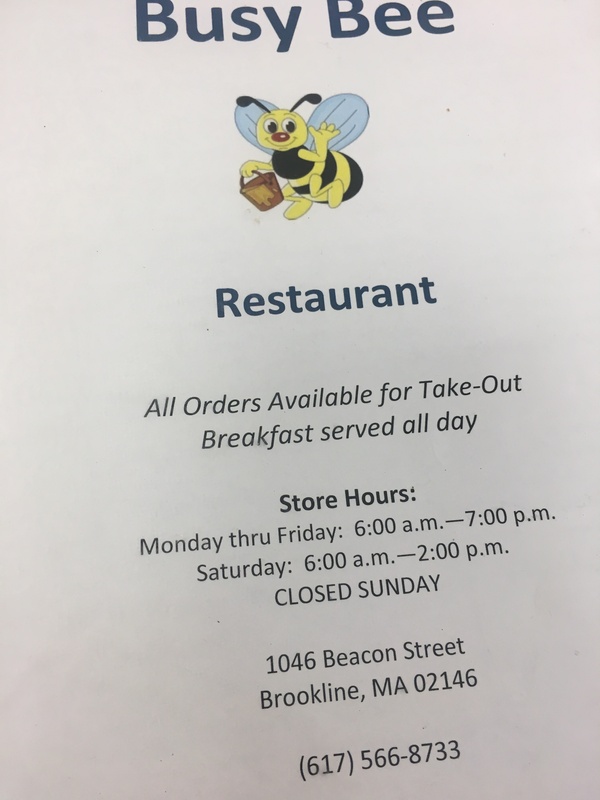 Located in Brookline is the Busy Bee Restaurant, a mainstay of the St. Mary’s Street area. It was bought by Peter Christakis in 1967, with wife Frances by his side, and has been under his tutelage since. I always saw the Bee in passing as I rode the “C: Cleveland Circle” train into Coolidge Corner. And the few times I’m on St. Mary’s, I’ve acknowledged that it has remained while its neighboring stores have changed entirely. For a diner fix, and someplace different, I finally went to the Busy Bee this week. The outside as familiar as ever, the lettering is simple and plain, spelling out the name. 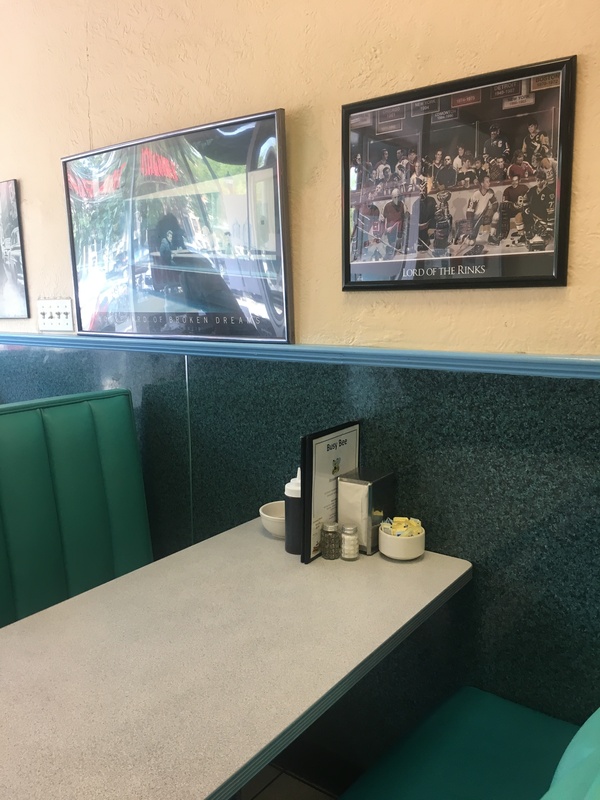 Inside, as I slowly took a stool chair right at the counter, I was pleasingly taken aback by the vivid choice of turquoise in the diner. The cushioned backs of the booths and top of the swivel chairs carried the color well and overall the Bee was very bright. (Nevermind the lightning in my photos!) Its set-up was a standard diner and the colors gave a modern vibe that felt almost ’60s. I was greeted with a low “Hello” from a guy behind the counter in a 40th Anniversary Tour t-shirt for the band Boston. He took the menu held up by the napkin tallfold dispenser and gave it to me. I looked but had already decided to get pancakes and bacon, my definite go-to when not craving chicken fingers and fries from restaurants centered on classic American dishes. I watched the Boston band guy make the pancakes in front of me, and when the plates gently swerved my way and he had filled a glass of water, more patrons came in. With the exception of my presence, it seemed to be a regular for everyone else. You could say the atmosphere was Cheers-like, just lighter on the camaraderie as far as we were all more subdued than the hyper characters of the Boston-based show. One young adult male came in just looking for a Coke in a movie-theater sized large, which I thought was unique. He could’ve gone to a nearby convenience store. 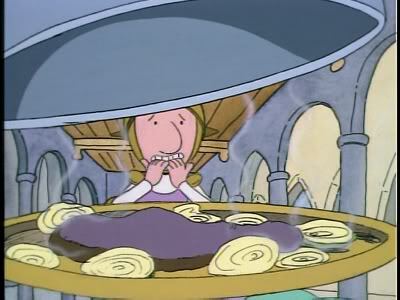 I was also surprised to see an elderly eat actual liver and onions as an episode of Nickelodeon’s Doug had haunted me about the possible ick factor of the duo. Pass the TV screen on the wall, playing an unbearably boring news station, was a staircase. From there, I was reminded of the local rumor that the Busy Bee was once a hangout of Boston gangsters and possibly housed some Mafia-affiliated “situations.” An “in-case-you-missed-it” expose about Brookline’s place in the history of Boston’s thug-life, published by The Brookline TAB in 2001, was a fact that “Flemmi and ‘Cadillac’ Frank Salemme used to chow down at the Busy Bee Diner on Beacon Street.” I didn’t receive any ominous vibes personally, but the staircase, because of this tidbit, reminded me of the scene in Martin Scorcese‘s Casino in which Sharon Stone‘s character Ginger was violently manhandled down a flight of stairs by Joe Pesci‘s Nicky. (Casino featured an Italian-mob storyline. Not at all surprising if you’ve seen of Scorcese’s greatest works in cinema). I almost finished all three pancakes and after staying for an hour, watching the thickly accented waitress kindly check on her guests and reading a book on my Kindle, I paid and gathered my things. I give the food three solid stars. The pancakes were fine. I felt like I’ve had slightly better, but by no means awful. (I think they could’ve been baked longer). I would come to the Busy Bee again. The closer to closing time (7 PM) it got, a snappy elderly man was verbally making the rounds, as he sat on a stool at the same counter as me. I guessed that it was Christakis, but can’t confirm as I knew of his name after drafting this article. Boston Magazine mentioned that this Christakis was “brusque”, provoking complaints on Yelp. I had no issues with him and he was gracious when I aimed for the door, as all of the staff individually said goodbye to me. 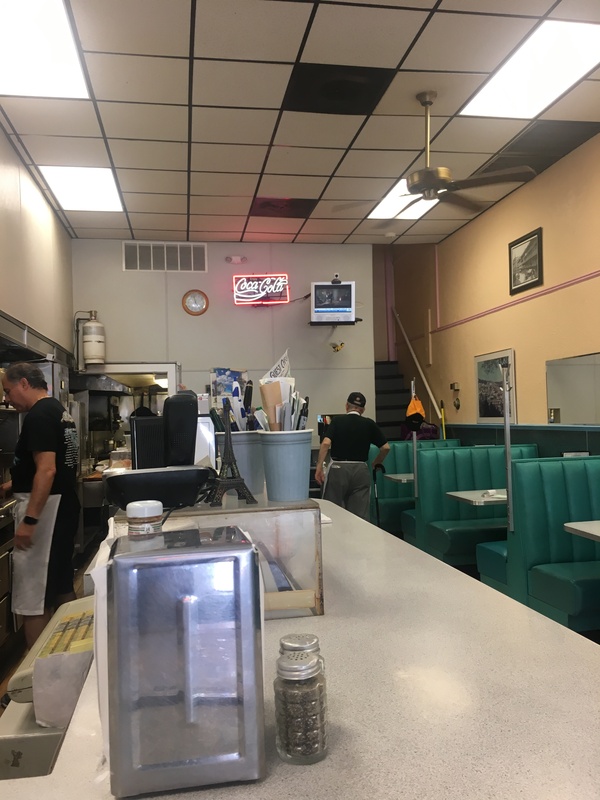 I like that the Busy Bee is fifty years strong in Brookline and I hope to venture out again to the diner to see what else they can cook or bake deliciously. Something tells me those sandwiches are damn good.